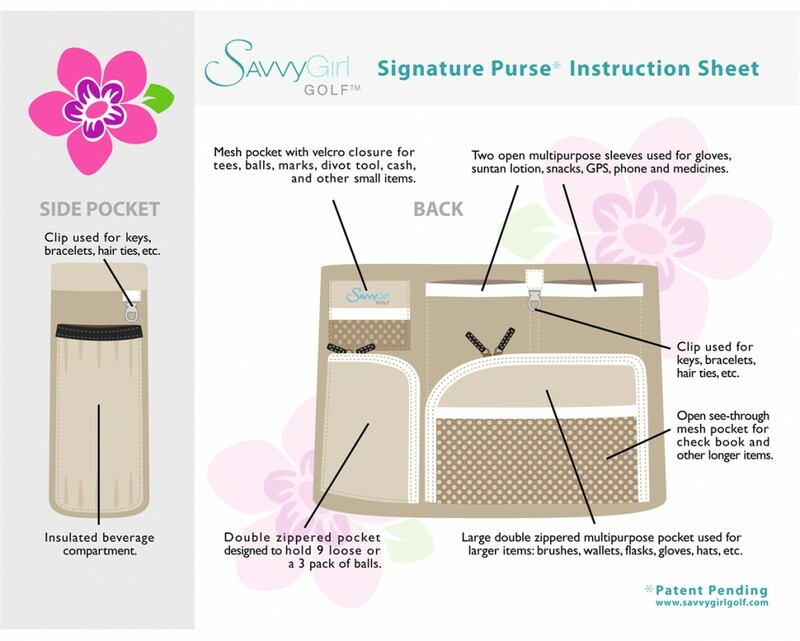 Let’s explore some of the 29 pockets, clips and compartments featured in the “Signature Purse”…. Fashionable rolled double handles with 7” drop. 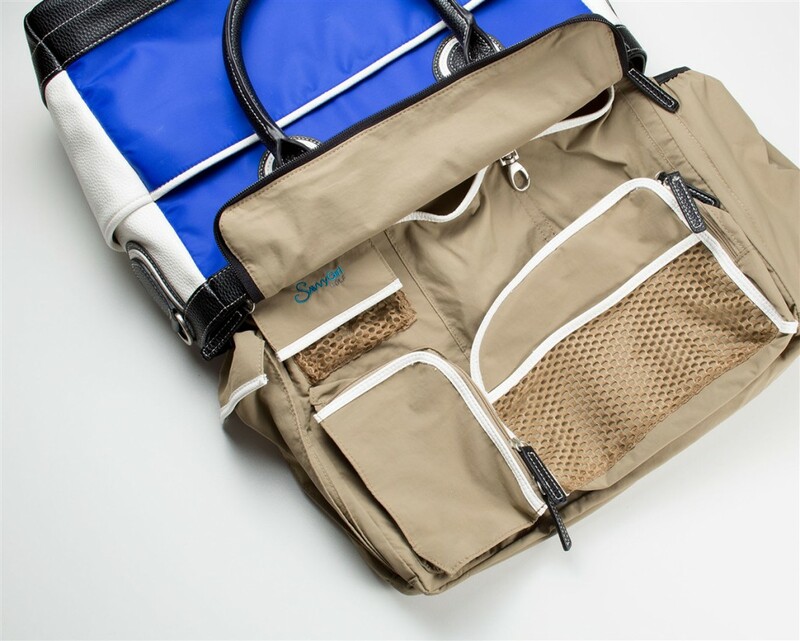 Easily converts to a shoulder bag by attaching the variable length shoulder/cross body strap. A ridged bottom with metal feet adds stability and prevents scuffing your purse. Full length padded pocket with zipper. Elastic loops for pencils, Sharpies and lipstick. Durable clip that holds keys, hair ties, etc. Three slots for business or credit cards. Large back pocket has two hidden magnets to help keep items secure. Two pockets on each end of purse. Large pocket with durable see-thru mesh insert. 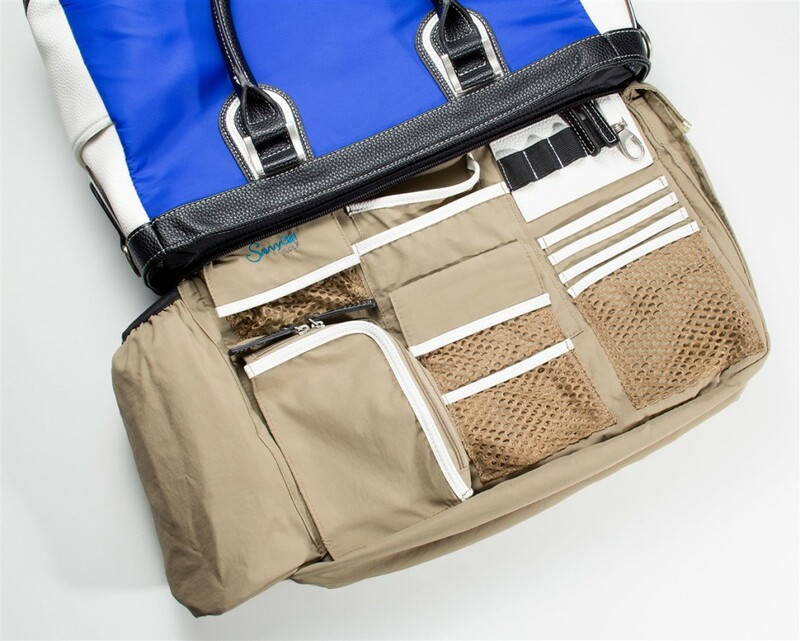 Large pocket designed to hold a sleeve of golf balls, or up to seven without sleeve. Unique “U-Shaped” zipper designed to open wide to easily place and retrieve items inside. Large center compartment holds jackets, sweaters, visors, etc. Durable scuff-resistant material. Wipes clean with a damp cloth. 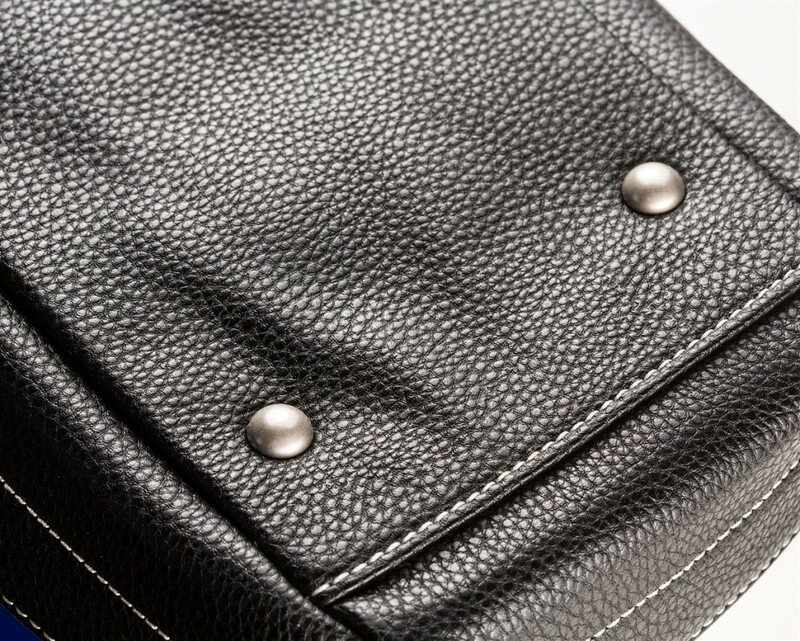 Protective metal feet keep the bottom of the Signature bag clean. 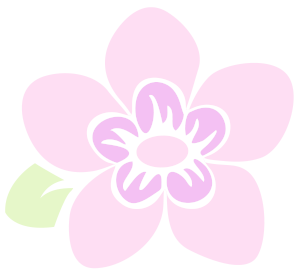 Beautiful, fashionable and functional. 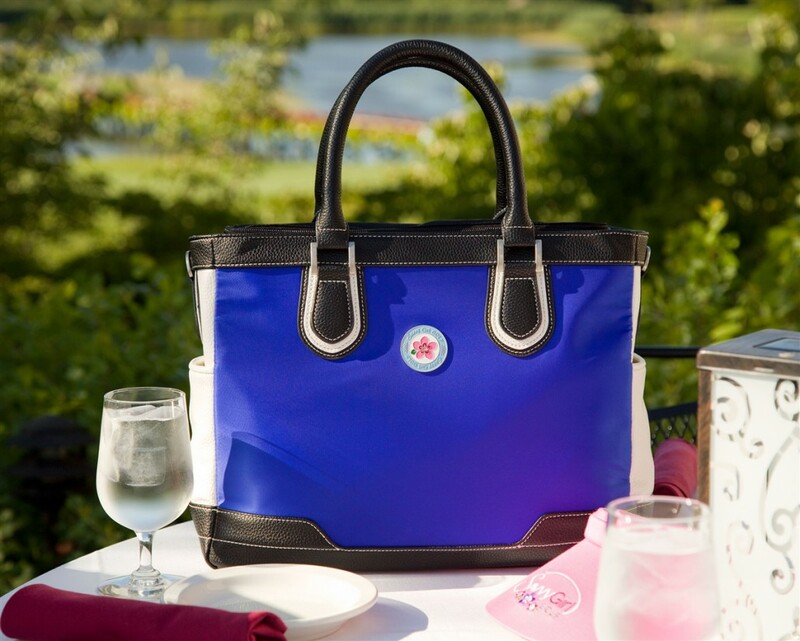 A purse that looks lovely on and off the course! 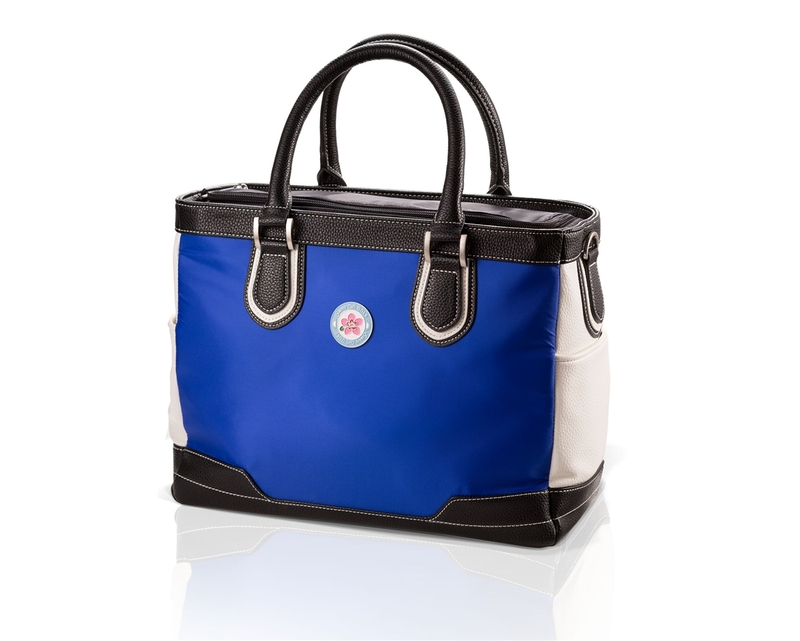 Features 29 multifunction pockets, clips and compartments and a top U-shaped double zipper. Fashionable rolled double handles with 7″ drop. 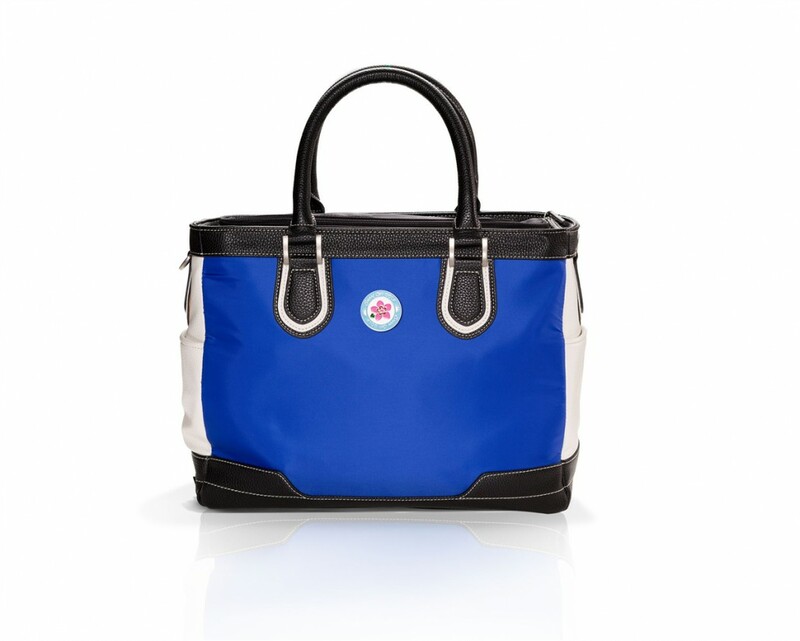 Easily transform your handbag into a shoulder bag with the included variable length strap. The fashionable exterior features two end pockets and one full-length pocket. 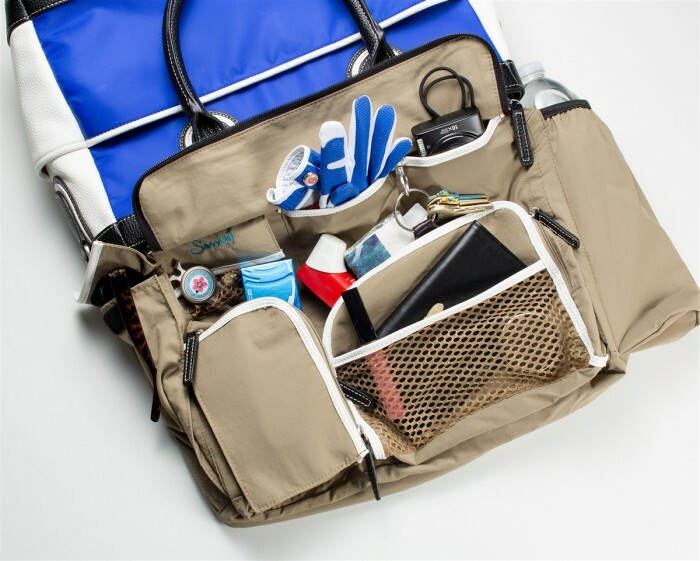 The interior features extensive organization with one large center compartment. 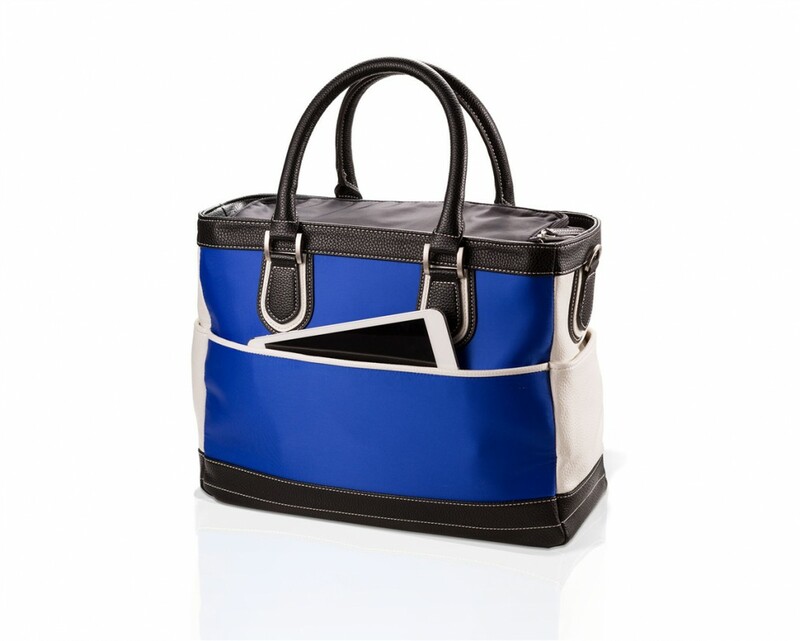 Strong enough to stand on its own yet flexible and foldable for easy packing. 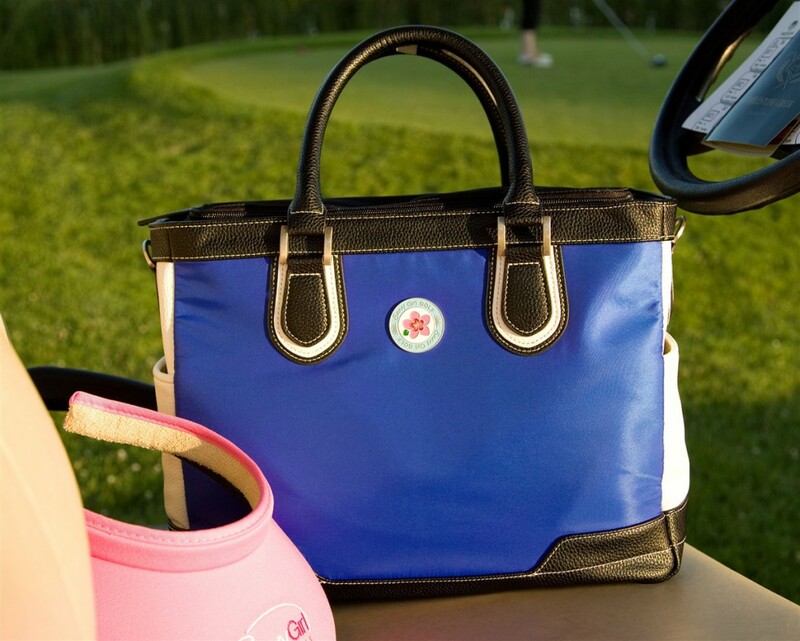 A cleverly hidden magnet allows to you attach a ball marker on the front of your purse. Large center compartment for jackets, sweaters, hats, visors, etc. 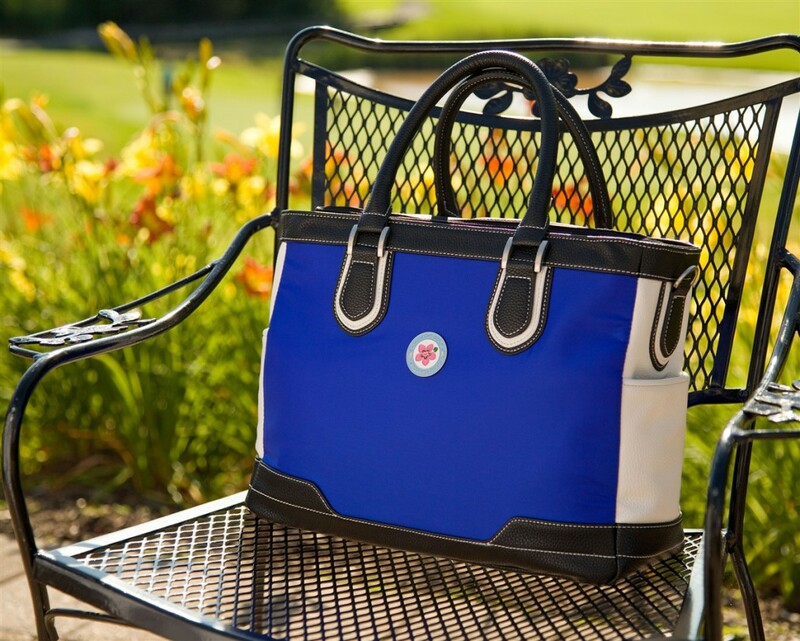 Fitted with a full-length padded tablet/document compartment. 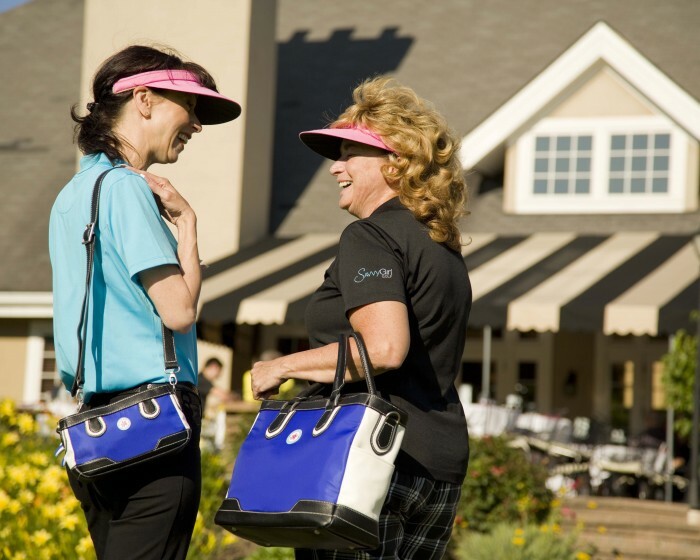 Two see-through mesh pockets with Velcro® closures for ball marks, tip money, tees, etc. 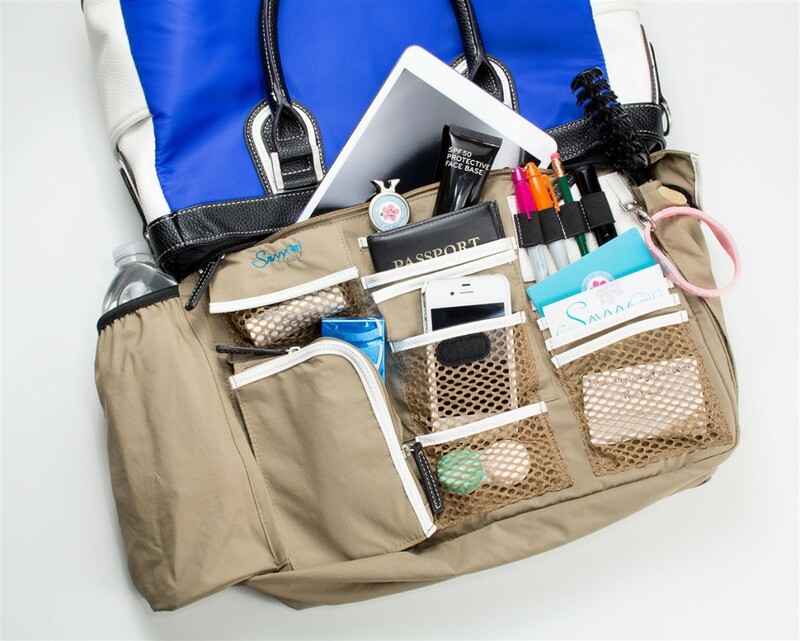 Seven multi-purpose compartments for gloves, socks, cell phones, GPS, snacks, etc. Three see-through mesh pockets hold variable size items such as check books, receipts, medicines, etc. 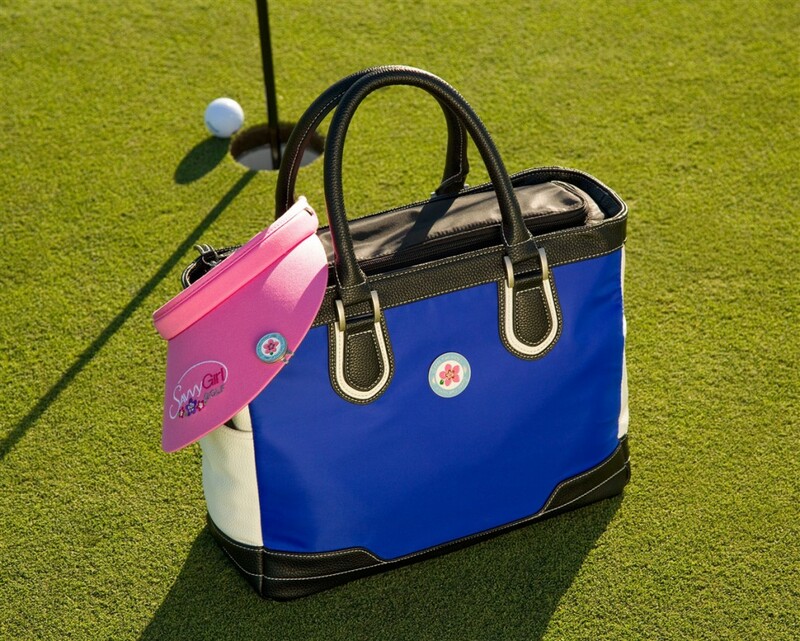 Two doubled zippered compartments each designed to hold 3-7 golf balls each. 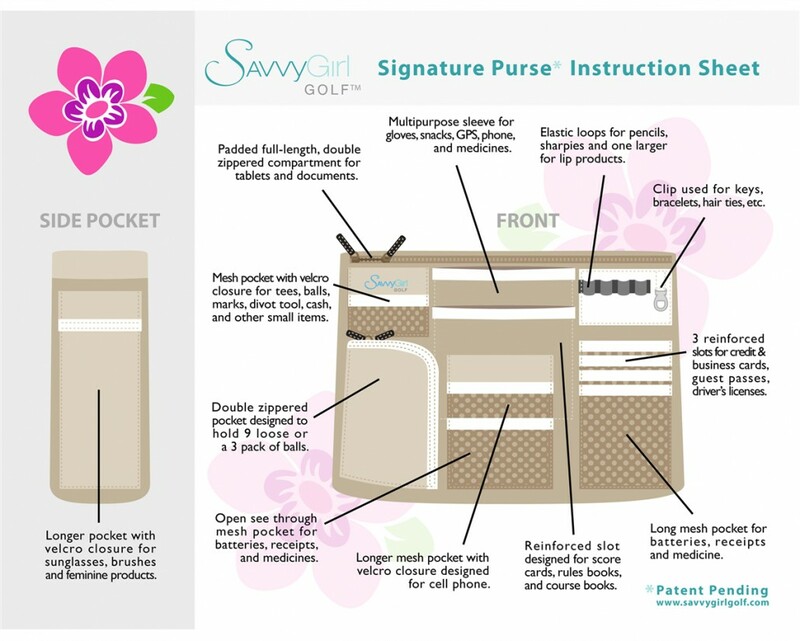 Flat pocket designed for scorecards, rulebooks, course book, passport, etc. Long Velcro® closured end pocket designed for brushes, sunglasses, or feminine products. Large double zippered compartment for long strap, wallets, cosmetics, medicines, snacks or games. Three elastic loops designed for pencils, sharpies and one longer length for lip products. Three slits are designed to hold your credit and/or business cards. Three clips for keys, sports bracelets, hair ties and rings. 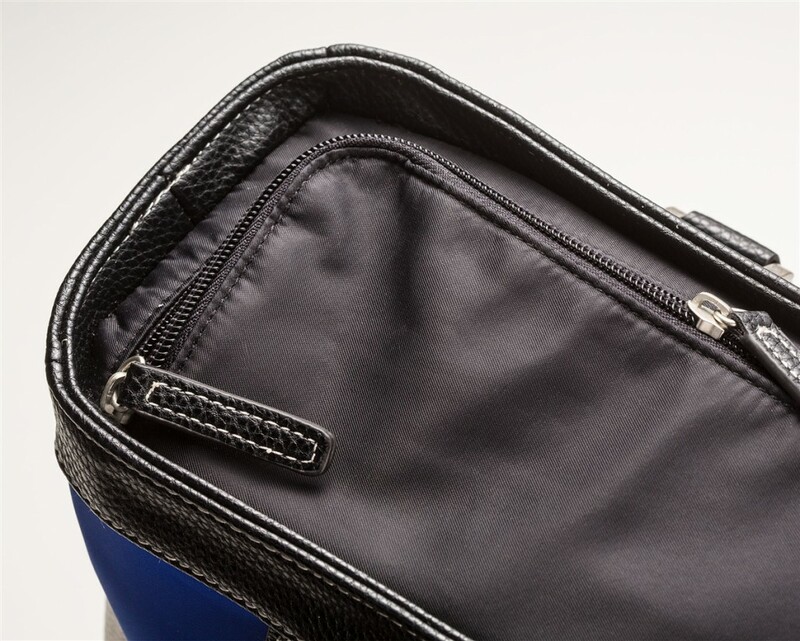 The longer length zipper pulls allow for easy opening and closing.